No offense Nathan..... you just need one well placed round. Depending on your flavor from about .50 cents to $4.00. Im glad you guys are figuring it out and getting ahead of them! But more video and hair samples is NOT the answer to solve the mystery. Your gonna need a body. Its a sad truth. We have discussed this before and I agree that taking an individual is the best way of closing the door but I don't think I am the guy to do it. I do have to disagree that we can't acknowledge the species without the body, I think an entire gene sequence, good video and the replication of our methods by others will get enough academic interest. We have cataloged other branches of hominids off of a sequence and bone fragments ( nearly indistinguishable from neanderthal remains ) so I think the there is still room here.
. Even more critical biologically is the consideration of the extreme difference in reports in Washington and, say, Iowa. As a somewhat humorous thought, we have quite a witty and funny forum friend here (Incorrigible1) who lives in Iowa and demonstrates that Iowans are much like people everywhere (because, believe it or not, I know such fun and witty people in Alaska), but Iowa must have an aversion to bigfoot hoaxing compared to people in the Pacific northwest from San Francisco Bay to Bristol Bay in Alaska. Again, that is simple unreasonable. OK, I like that line of argument. I'm completely comfortable with the drop-off in the number of BF sightings reported over the decades. I think it is explained by the fact that there was a tremendous number of unreported encounters at the BFRO database was initiated. The decrease in reports is probably only the result of working through that backlog to bring them more current. The consistency, or congruency in the BF descriptions is made all the more compelling when you realize that the behaviors observed are typical not only of Sasquatch, but also for a myriad of other wild creatures It is a database full of descriptions of an animal doing things that known animals do as well. Manufacturing this degree of biological congruency would be absurdly difficult to hoax. As a WA BFRO investigator I can say that you are correct. We also have lost membership in recent years here in the Western US and so that has effected our volume output. What sort of distribution, mean, mode, whatever would you expect from hoaxed sightings? Why would you have one expectation over another? Farenbach used a similar sort of argument, and I could not completely follow it. I am not saying it was wrong, just that I could not quite get his logic. I would expect hoaxed numbers to have a bell sort of distribution, if the were independently generated. I am not sure that I am right, but if there is another sort of distribution, why would that be the case? Similarly, why would the average size be a higher number? You could be right, but I would like to hear the arguments. SSR folks, have there been analyses of rainfall versus sightings? Sorry I couldn't get back to you sooner; work is crushing me. First, there are relatively few confirmed hoaxes, so you are right, it is more difficult (if not impossible) to discern patterns in hoaxes or suspected hoaxers and people who appear to chronically label every item they encounter in the woods as "Bigfoot!" (tm). Bigfoot encounters are very rare when distributed over time (e.g., the entire northeast) and space (e.g., the last 100, 200, or more years). 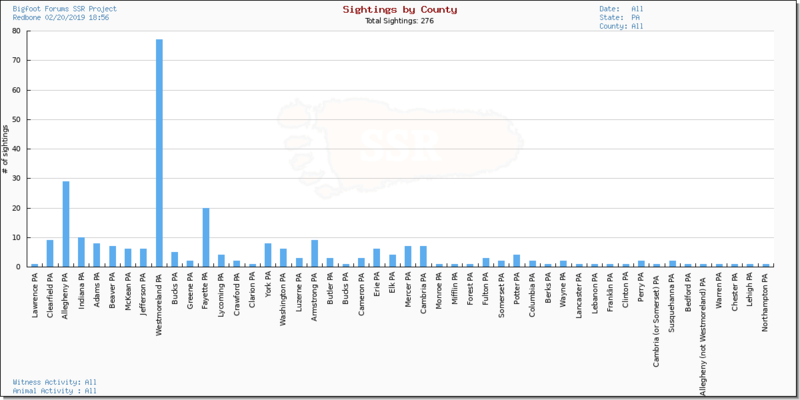 Even when there are websites that report hundreds of encounters in a state (for example, the PA Bigfoot Society or PA Research Organization), those encounters are very infrequent and very scattered - it takes time to generate the data to be able to identify clusters in time and space, particularly since most organizations sub-divide based on county which is likely wholly unimportant to bigfoot. So when you look at the data you find that encounters that are clustered - using that term very loosely - are usually 4-5 encounters spread out over 10-15 years and about 400 square miles, usually in certain terrain types in the northeast. So if an investigator is suddenly reporting 10 encounters in one year in a 30-square-mile area of open flat farmland w/no significant woods or swamps and that investigator (or an immediate family member) is the only person having encounters - at their houses, which are miles apart - and no one in the intervening area is having encounters, yes, I am more likely to conclude those are not valid encounters. I'm not going to specifically state that "x person is a hoaxer" as I realize that mere statistical analysis can't rule in or rule out Bigfoot. There could be other explanations, which I am not inclined to debate. But for my purposes, certain clusters are red lined and ignored as probable hoaxes and/or probable miss-identifications. Could it be that a hoaxer thinks they have to stick to the norm, or close to it, in order to be believed? My brother, some sort of PhD or some such, has provided me a few scholarly articles on "tells" identified by academic studies of people who lie in written in oral communication. Unfortunately, I have not had the time to read (and digest) them all, and request that he provide some additional cited studies. Then, frankly, I don't know what to do w/them - pointing out that you can see the zipper in a hoaxer's suit doesn't necessarily stop hoaxes, it just leads to new hoaxers trying to improve on the old hoax. I just need to get my membership already, LOL. Can I get your breakdown on this map gif ? I see an assortment of color that I assume are different report grades. Interesting boom from 2000 to 2009.
can you put one up for WA state ? Below is the same data with NASA's Night Lights layer. Please note that the night lights are from this decade, in the 70's and 80's urban sprawl was much less. DNA is problematic. Is there a chance? Sure. But far from expedient. And the risk of failure is great. Contamination, misidentification, lab loses or destroys sample, etc. You say your not the guy to do it. I understand that. But would you be willing to work with someone who was? In the right place and the right time? This mystery could be solved in a nano second. I think it does, and I believe that the rainfall is above 50 inches per year, and the higher the precipitation, the greater the densities of sasquatch reports as well as the greater the density of black bears, too. One of my favorite sasquatch academics, Roger Knights, theorized that the best sasquatch habitat dumped upwards of 100" of rain per year, was the highest black bear habitat on the continent, and probably boasted 1 sasquatch per 200 black bears. #Sasquatch - Let's talk Arizona. 85 Total Reports, with 11/15 Counties responsible for those Reports. Where do you think we should go on vacation this Summer ? Westmoreland County PA? 78 reports in, but only 16 came after 2000. I have no looked at the data dictionary or data model for the research database, but it seems to me that we could look for consistency in any number of dimensions. Here is a quick take on some factors. Which are the key ones in an analysis of consistency? Gets complicated does it not? I imagine the folks working with the data have given this more thought than I have. Absoluteky Mike, for years too. I personally, rightly or wrongly, like to go top heavy on what I’ve kept quoted in your above post. There are certain parameters I give less weight to due to a number of reasons, largely though to my perception of them being too subjective.